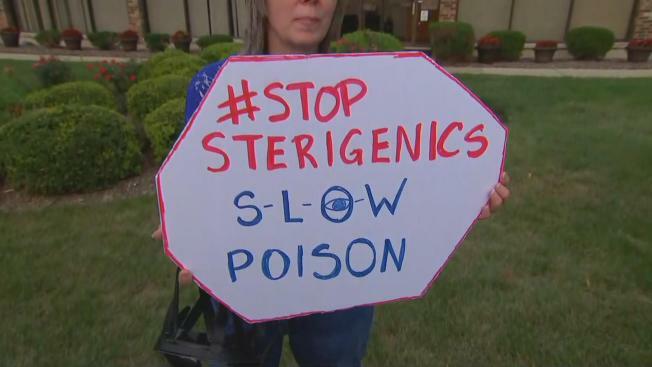 The U.S. Environmental Protection Agency has agreed to perform "ambient air testing" at the Sterigenics facility at the center of an emissions controversy in Willowbrook, DuPage County officials announced Thursday. The announcement follows a heated meeting this week where residents demanded answers over a federal investigation that found the company has been emitting an invisible cancer-causing gas for decades. “It is gratifying to know we can make an impact at the federal level on behalf of the residents of Willowbrook and DuPage County," DuPage County Chairman Dan Cronin said in a statement. "From the very beginning, we have been calling for ambient air testing so that residents could get some assurance that the air they are breathing is safe. The lack of information has led to anxiety and misinformation, so it will be extremely beneficial for the public to have a trusted site to consult for scientific data they can understand. Our goal has been and continues to be, to protect the safety and health of our residents." Cronin added that there will be a website accessible to the public that will provide results from testing performed at the facility Sept. 20 and 21 and the ambient air testing. Sterigenics announced that independent air quality tests this month registered emission levels "below detection limits" and confirm there is "not [an] immediate health threat or...an emergency situation." “Unfortunately, the community has been exposed to a lot of inaccurate and misinterpreted information and we are committed to getting the real facts to residents who, based on what they have been hearing and reading, are understandably concerned," Kathleen Hoffman, Sterigenics’ senior vice president of global environment, health and safety, and technical services, said in a statement. Last month news broke that, according to a federal investigation, the company is emitting an invisible cancer-causing gas called ethylene oxide--and has been since the 80s. “Eight out of 10 families on one block have had cancer in their family," said Andrea Thome, who moved her parents to the southwest suburb, said. "Many with no family history. There aren’t any coincidences here." The Thomes are joining thousands of others demanding answers. A few dozen met with attorneys Wednesday to coordinate next steps. A spokesperson for Sterigenics said it is operating up to Environmental Protection Agency standards and always has. "We have always been committed to ensuring that the ethylene oxide ('EO') used to sterilize life-saving medical products at our Sterigenics Willowbrook facility does not present a health threat to the Willowbrook community by operating well within permitted levels," the company said in a statement. "Our air quality control equipment is state of the art and the recent voluntary equipment upgrade that reduces our emissions." Sterigenics said medical devices such as syringes and surgical procedure kits are sterilized at its Willowbrook facility. They noted that any disruption to the process of sterilizing the medical tools "could result in unacceptable and life-threatening delays." You can view the 2014 National Air Toxics Assessment here. Just type in "Willowbrook, Illinois."